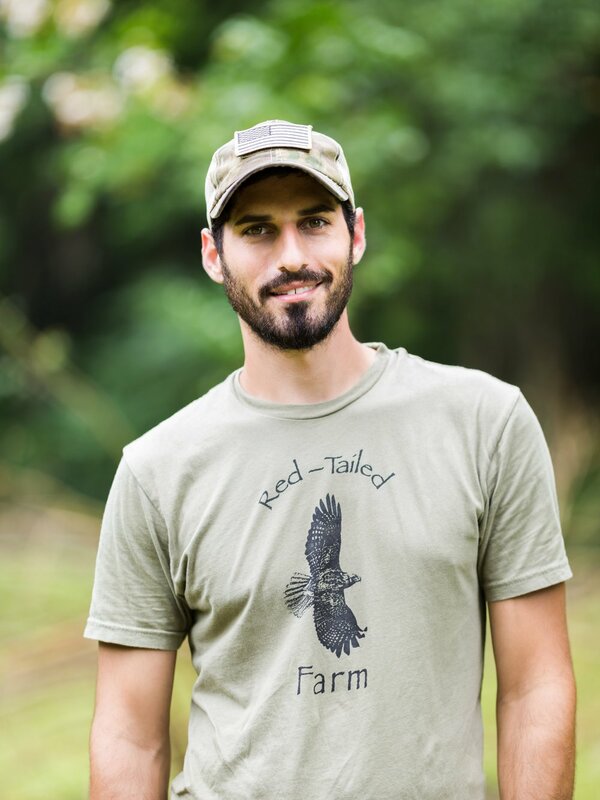 Located in the small town of Burgaw North carolina, not far from the historic coastal city of Wilmington, Red-Tailed Farm was esablished in 2015 by co-owners Juliann Janies and Gregory Hodgdon. 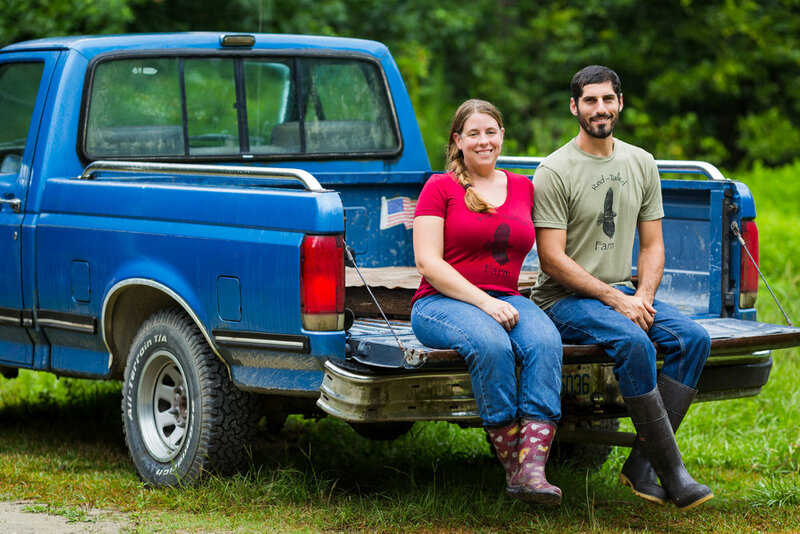 These two met and became friends while apprenticing at Fickle Creek Farm in the Piedmont area of central NC. There they learned to care for a variety of livestock in a mixed pasture and forest agricultural system. Soon they realized that they had the same vision for a farm of their own and decided to team up. After an extensive search for affordable and usable land, they settled on a 14-acre lot with a nearly 100 year old transplanted beach house. While the property had a lot of potential with good soil quality, drainage and a private well, it also was suffering from years of abuse and neglect. The previous owners had littered trash all over, including hundreds of soda bottles, several TVs, windows, toilets…the list goes on and on. The large front pasture had a tangled mess of decaying barbed and high tensile wire fencing in it and deep ruts that appear to be carved by vehicles driving around recklessly. The forested areas were filled with the scrap metal remains of poorly built pig shelters, buried sections of old fence, and of course more trash. two dilapidated Mobile homes, a disgusting chicken coop and a few other Decrepit shelters were left as well. The house, while livable, was definitely in need of some updates and repairs. Greg, Julie and a bunch of supportive friends went to work immediately picking up trash, tearing out old fence and knocking down useless structures. There were plenty of treasures to be found as well, such as an old Allis Chambers tractor with a variety of implements and tools of all sorts. Anything that could be useful was salvaged And the rest of it went to the dump. in fact The salvage pile provided the raw materials for our first mobile chicken coop. We started our farm business by first producing eggs from hens out on pasture, and began rotating them around the property in order to fertilize the soil. soon we had quite the customer demand for our eggs, and were able to use the profits to buy our first piglets. Things grew naturally form there, and before long we also had a flock of sheep and goats, rabbits, turkeys, ducks and a market garden. The first few years we sold our products by word of mouth only, mainly to friends and family. This allowed us to fine tune our practices, such as housing, nutrition and genetics of our animals and get some honest feedback on how to achieve a consistent, superior product. In 2017 we started attending some of the area farmers markets, which is where we primarily sell our products today. We had a Rabbit from you on Sunday (ohemgee!) it was AMAZING, and grilled pork chops yesterday.